The Sapphire Low is part of the ‘Main Street to Mountains’ collection from Oboz which offers versatile styles that aim to balance a refined, fashionable look with trail-ready features. Oboz designed the collection by carefully examining the anatomical and biomechanical differences of women’s feet, ankles and legs to create a New Fit System from the ground up. Designed with women in mind the Oboz’ Sapphire Low prioritizes fit and performance for women in a supple leather shoe. It has an easy-flexing three-part midsole and includes Oboz’ highly supportive O FIT Insole™ which supports the arches of the foot. Soft nubuck leather, lined with Oboz’ B-DRY waterproof breathable membrane, keep feet dry & warm from street puddles to mountain streams. 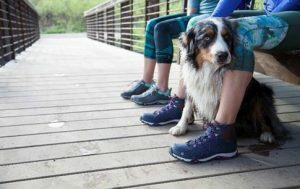 Underneath, the Sapphire’s low-profile midsole and Swiftcurrent outsole cushions protects and provides grip on the trail without extra bulk. Also available as a mid-ankle rise boot.